Hotel Minibars, Loyalty Gifts And More! Do Something Different! If you run a hotel, how do you ensure you are remembered with a smile by your guests? How do you ensure they come back again and again, and recommend you to others? By being different and offering originality! 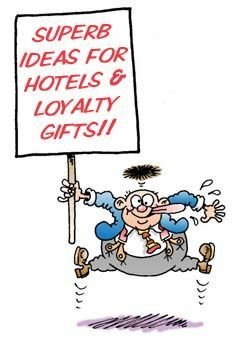 Here at A Quarter Of we supply a few select hotels with unusual gift ideas, or minibar fillings, and our quirky and fun products go down an absolute treat and, more importantly, create an impression. ► Unusual Mini Bar fillings - Forget peanuts and crisps! We can supply you with our fabulous mini glass jars filled with your choice of fillings - and a branded mop-head with your logo and any message. The most requested is the mini glass jar filled with our most popular retro sweets: Blackjacks, Kola Kubes, Refreshers, Shrimps, and Fried Eggs. They are so much fun, and ensure that your hotel name is never forgotten! ► Create a sweetshop! - Alternatively, create a mini sweetshop for your guests - a selection of bags of our most popular retro sweets! We can create any selection of your choice. ► Conference Giveaways - If you organise conferences or large parties, and you need to source a unique memento for attendees, we can put together personalised bags of sweets for you that can suit any theme or budget. Note that minimum order for this service is 150 bags. If you would like to discuss any ideas with us, you can email Sol, who deals with all special relationships here at A Quarter Of - she will be delighted to hear from you. Her email address is Sol@AQuarterOf.co.uk, or call 01254 262 160.